Have you every wanted to try stand up paddle boarding with your dog? Now you can can!! 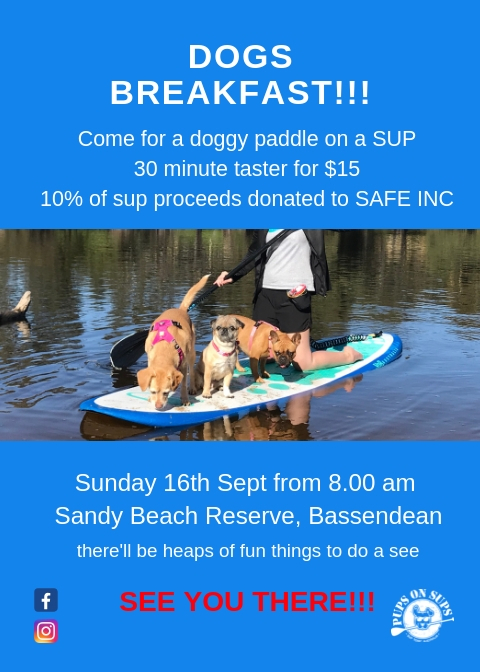 PUPS on SUPS is in partnership with SAFE INC to raise awareness of the foster and adoption options for rescue dogs so if you’re not quite ready to take the ride, come and have a chat to the SAFE crew about the amazing work they do and have a gigggle with us as we entertain with our antics on the water! We’ll also have our fund rasier rashies available on site for you to check out! 10% of proceeds will be donated to SAFE INC or drop a gold coin donation in the tin!